The outstanding balance is uneconomic to complete. It is better to use the Write Off option when recording the receipt—see Write Off Option—use the following method only if you forget to do it there. You can highlight more than one invoice in the list by shift or control/command clicking. 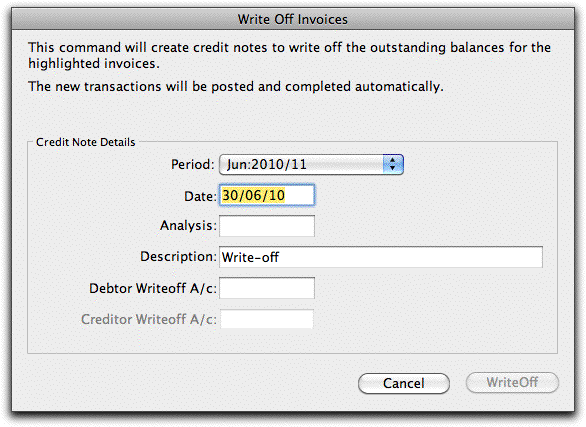 The Write Off Invoices dialog box is displayed. MoneyWorks “writes-off” an invoice by creating a credit note (negative invoice) for the outstanding balance of the invoice, and then contra-ing this against the original invoice. If you are writing off Sales Invoices, you will be required to enter an account code for a Debtor write off account (e.g. a bad debts account). Similarly, if you are writing off Purchase Invoices, you will be required to enter an account code for a Creditor write off account. If you have selected both types of invoice for writing off, you need to specify one of each type of write off account. If you used the Write Off command without first highlighting the transaction to be written off, a list of available transactions will be displayed. Locate and highlight the transaction in this list and click Continue to display the Write Off window. The credit notes will be created, and the written-off invoices will be removed from the Payables or Receivables lists. Note: If the original invoice contained GST, this is pro-rated over the amount written off and included in the credit note so that GST is correctly accounted for. It does this regardless of the tax code associated with the write off account. For this reason it is a good idea for the tax code of the write-off account to be the same as those used on the invoice, otherwise the transaction may be flagged as an anomaly on your GST report. Note also that the write off account cannot have a tax code of “*”.